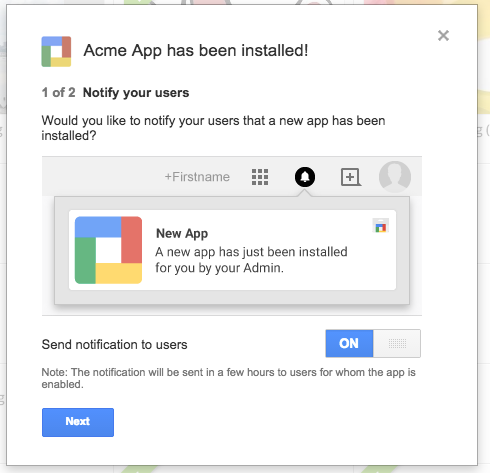 Today we’re announcing two changes to the post install experience for Google Apps Marketplace. Both changes are geared towards improving end user awareness and active usage of your apps. First, after installing a Marketplace app, admins will be given the opportunity to send a notification to end users. This enables admins to easily tell users that your app is now available, and how to access it. The notification will only appear to the users in the Organizational Unit (OU) or domain for which the admin has installed the app. The notification will appear in each user’s Notification Center and will describe how to access and launch the app. Second, we’ve completely changed the post install experience itself, making instructions for accessing your app clearer. 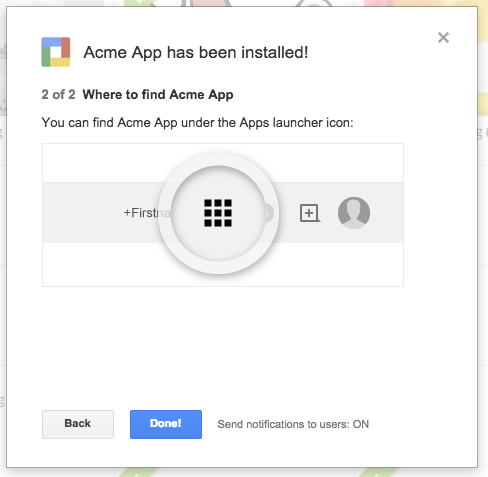 During the post install experience, we now show how to access all the extension points of your app (e.g. Apps launcher, Drive, Add-ons to Docs, Sheets, and Forms). For more information on this feature, please see the Help Center article.